OTL Blog » Blog Archive » OTL offers seven infringement festival projects! OTL offers seven infringement festival projects! Optative Theatrical Laboratories is proud to announce seven unique theatrical projects for the 2011 Montreal infringement festival. Traditional favourites like Car Stories will appear alongside Red Light District and Greening Montreal walking tours (including an ecological picnic), a birthday party to celebrate Cultural Resistance, a screening of our new film “Global Invisible Theatre”, plus a new theatre experiment called Infringement Therapy. The seventh project will be a Grassroots Arts Leadership Award. It will be handed out during the festival to a member of the Montreal arts community who has demonstrated leadership at the grassroots level and who is at a point in their career where the award could make a major impact on their practice. Optative Theatrical Laboratories is also marking 2011 as a special year because it is the 10th anniversary of being kicked out of the Fringe Festival. 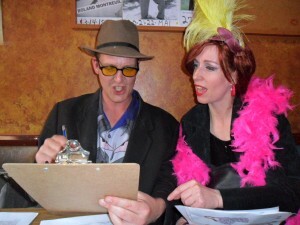 In 2001, OTL show Car Stories became the only show in the history of Fringe theatre to be kicked out of a festival, on orders of a corporate sponsor. The trend to corporatize the Fringe began in 1998 when a Toronto-based organization called CAFF trademarked the word “Fringe” in order to sell products such as “T-shirts, caps, brochures, programs, posters and mugs.” In addition to becoming trademarked, the Fringe began charging “service fees”, insisting that artists “pay to play”, and allowed a flood of corportae sponsors and advertisers to take control of the agenda. Artists were horrified that an authentic, community-based event could be so easily co-opted. The realization that corporations now took precedence over artists at the Fringe Festival sparked local Montreal theatre activists to create the international infringement festival movement. A network of festivals in cities across the world, it was designed to protect culture from corporate abuse, to highlight arts activism and critical thinking, to challenge the idea that the arts need to be co-opted in order to “succeed”, and to demand the democratization (instead of corporatization) of the arts. It is a fitting time for reflection because Montreal is currently witnessing a Cultural War of unprecedented proportions, pitting local artists and citizens against powerful corporate forces that are attempting to transform Montreal into the equivalent of Times Square or Disneyland. Corporations that have been spamming the city with visual pollution, co-opting the festival scene for advertising purposes, and attempting to destroy heritage buildings and living culture in the Red Light District, amongst other oppressions. It has reached such a point of saturation that Montrealers of all stripes are starting to take charge of the situation and fight back! 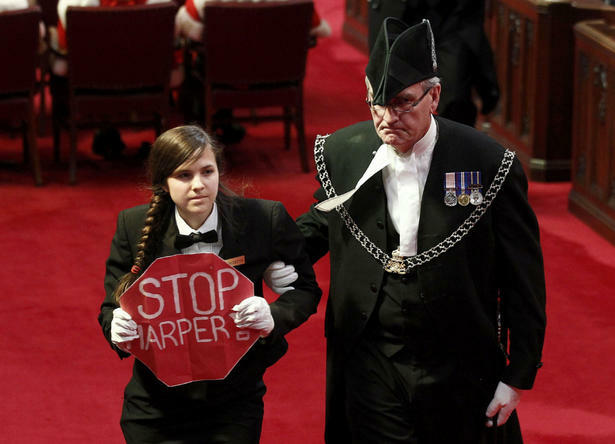 Indeed, the art of infringing has even spread to the Canadian Parliament, where rogue page Bigitte DePape recently culture-jammed the opening Throne Speech of the right-wing Harper government. For its 8th edition, running from June 16 to 26, the Montreal infringement festival is celebrating by joining the good fight! Celebrating Freedom of Expression, activist performances and a broad range of eclectic, independent, and controversial art of all forms, the Infringement Festival is modelled on the original 1947 Edinburgh Fringe, which was an artistic protest against corporate elitism and exclusion of local artists. Artists and audiences of all backgrounds are invited to create a charged environment where people come together to take chances, push boundaries, explore uncharted territory, and to do so without corporate interference or having to pay any fees. Designed as an arts democracy, the Infringement Festival empowers communities, artists, and audiences to take charge of the culture and to use it as an incredible tool for social justice. Set mostly in the Plateau, Mile-End, and Quartier des Spectacles, this year the festival features over 50 shows and events, including street theatre, experimental performances, visual arts, music, spoken word, strange picnics and new activist films. OTL is very pleased to offer these seven unique projects for the Montreal infringement festival. One common theme that links the projects is Oppression vs. Activism in the City. The projects all highlight what Montrealers are doing to stop corporate harassment, reclaim public space, protect living culture and demand positive social change and justice in the city. 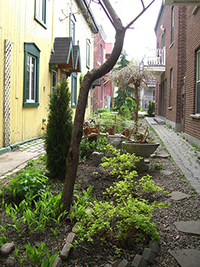 Saturday, June 18, 11 am sharp, at the Friendship Garden of Maison de l’Amitié, 120 Duluth Street east. Bilingual. Nous vous prions d’apporter du vin et des la nourriture Ã partager! Join burlesque queen Velma Candyass and cultural worker Donovan King on a walking tour of Montreal’s storied Red Light District. 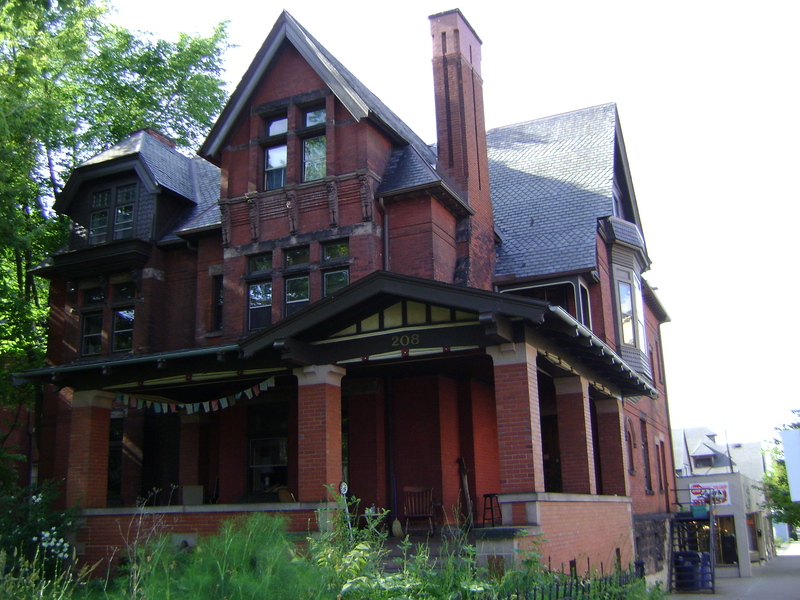 This tour looks at the Red Light District from the days of New France through the Victorian era to Prohibition and right up the 21st Century, and the unsuccessful attempts by various authorities over the centuries to control, destroy, or re-brand the area. Joignez vous Ã la reine du burlesque, Velma Candyass et guide culturel Donovan King qui vous guidront dans une visite du quartier Red Light de Montréal. Dans le cadre de la visite, on vous présentera l’histoire du quartier Red Light en partant de la nouvelle France en passant période victorienne et la Prohibition. Nous aborderons également le 21e siÃ¨cle et les différentes tentatives de contrÃ´le, de destruction et du rebranding de ce quartier par les autorités. En anglais. June 19th is famous in countercultural circles â€“ it is the day Car Stories got kicked out of the Fringe Festival on orders of a corporate sponsor in 2001. 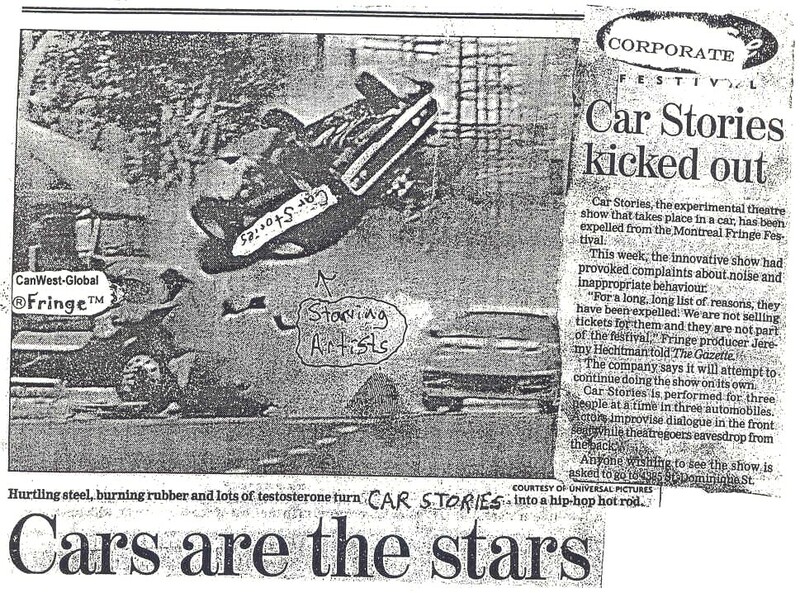 To celebrate the 10th anniversary of this cultural disaster, Car Stories is rumoured to be booking a limousine! The one-day-only show starts in the Parc des Amériques, the site where Car Stories was originally expelled from the Fringe Beer Tent in 2001. It is sure to be a theatrical joyride of unprecedented proportions – for only three spectators at a time! Sunday, June 19, 2 â€“ 6pm, Starts in the Parc des Amériques, Corner of St. Laurent & Rachel. Pay-what-you-can. RSVP early (optatif@gmail.com)! Le 19 juin est reconnu dans le milieu artistique de contre-culture. 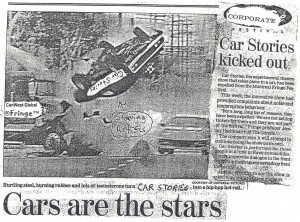 Ce jour lÃ en 2001, Car Stories a été retiré du festival fringe Ã la suite des directions du commanditaire principal. 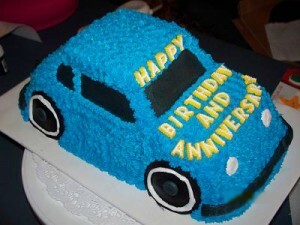 Pour souligner le dixiÃ¨me anniversaire de cette désastre culturelle, on a entendu dire que l’évennement Car Stories allait réserver une limousine! Seulement durant une journée, le spectacle débutera Ã la tente fringe oÃ¹ sera servie la biÃ¨re. qui ne pourra acceuiller que trois spectateurs Ã la fois! Célébrons le 39e anniversaire du créateur du festival infringement Donovan King avec de la biÃ¨re, du gÃ¢teau, et du infringing! OTL will be presenting the inagural Grassroots Arts Leadership Award (GALA) during the festival to honour a member of the Montreal Arts Community who has demonstrated leadership at the grassroots level and who shows potential ability to protect and enhance authentic Montreal culture. A reminder that the deadline for Email nomination (optatif@gmail.com) is Saturday, June 18, 2011 at midnight. The Award will be presented on the afternoon of June 19th around 6 pm! THE AWARD? A FREE TRIP TO THE BUFFALO INFRINGEMENT FESTIVAL! 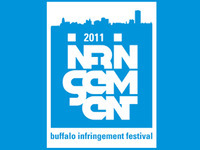 The GALA winner will receive a free trip to the 2011 Buffalo Infringement Festival (BIF) for a duration of their choice! Running from Thursday, July 28 â€” Sunday, August 7, the BIF is Western New York’s largest arts festival and is considered the most successful grassroots, community-based festival in the USA. With no corporate interference or fees compromising the festival, the Buffalo Arts community blossoms each year with diverse, powerful, critical, and meaningful performances in an energised community environment that is protected from corporate interference! The Award-winner will have ample opportunities to learn from (and collaborate with) the best in the field of grassroots arts management! Documentaries to be screened include OTL’s “Global Invisible Theatre”, as well as “Remembering Bagua”, “Mines Bases” and more! Pay-What-You-Can. Individual, couple, and group “clients” are given appointments for infringement therapy: after being diagnosed by a theatrical Doctor, they are prescribed an interactive, dramatic and therapeutic journey. 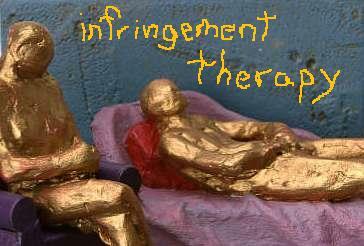 The goal of infringement therapy is to purge the “clients” of their deepest, darkest oppressions, and empower them to transform their daily social reality! Nous donnerons des rendez-vous aux individus, aux couples, et aux groupes pour assister Ã une séance de thérapie Infringement. Un docteur théÃ¢trale dirigera la séance et préscrira une aventure intéractive, dramatique et thérapeuique. La visée premiÃ¨re de cette thérapie est d’éliminer les oppressions les plus encrées et les plus sombres du patient. Ils auront par la suite le courage de transformer leur réalité sociale au quotidien! En anglais. It is looking to be a red letter year for the infringement festivals, and OTL encourages you to support the amazing infringement artists who are putting on over 50 shows this year in Montreal – and over 700 in Buffalo, New York! Please spread the word. Join the infringement, and reclaim the culture! This entry was posted on Thursday, June 9th, 2011 at 6:25 am	and is filed under Activism, Community issues, Culture-jams, General, Performance, Uncategorized, Video, Viral theatre. You can follow any responses to this entry through the RSS 2.0 feed. You can leave a response, or trackback from your own site. I!Also infringing The paperbag Queen/Dogwoman- a dadaplay! Three pay what you can nights with two original performances and live music!Spread the word!